It is very simple and nutritious vegetable. It is also very versatile, and can be used cooked, steamed, fried, and raw. 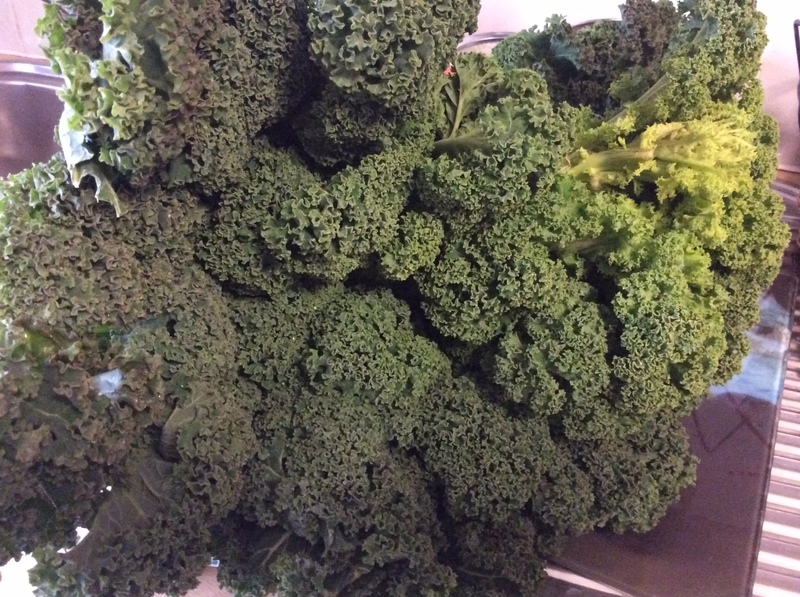 However, the kale is not easily digestible when raw, so you need to pay attention. In case you get adverse reaction after eating raw kale, such as bloating, or even pain, it might be better just to eat it properly cooked. I put kale in stews, woks, frittatas, soups, smoothies in small amounts and well shredded, and I make chips out of kale. These work well on top of salads, or Friday movie snacks. – spices of your liking, such as curry mixture, cayenne, chili powder, black pepper, dried herbs..
De-stem the kale and rip it into pieces. Pieces that would fit your mouth, or a bit smaller. Wash them well. The kale I used was not organic, so I soaked it in vinegar-water for about 30 minutes to get rid of possible pesticides, herbicides and other -cides. 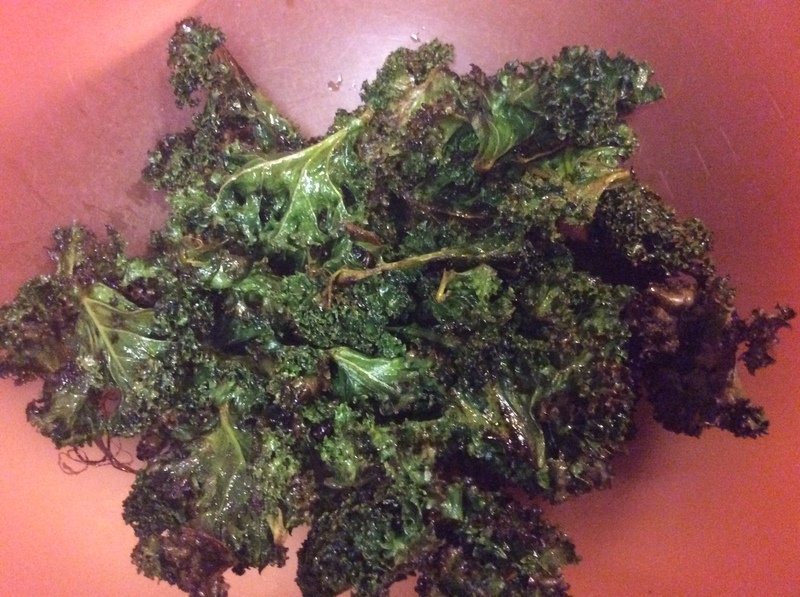 Then I rinsed the kale with filtered water and dried the pieces. Place the tin to the oven (about 170 degrees of Celsius) with the coconut oil in it, to melt the oil. When the oil is melted, remove from oven, very carefully not to burn yourself, add the spices you like and toss in the kale. Mix well to get the oil and spices all over the kale and place back to the oven for another 15-20 minutes. Check in regularly and mix again for even roasting. Remove from the oven, add the salt and mix gently not to break the chips too much. For the people who like vinegar in their chips, you can sprinkle some on the kale chips too. Then just put your favourite movie on and enjoy :). 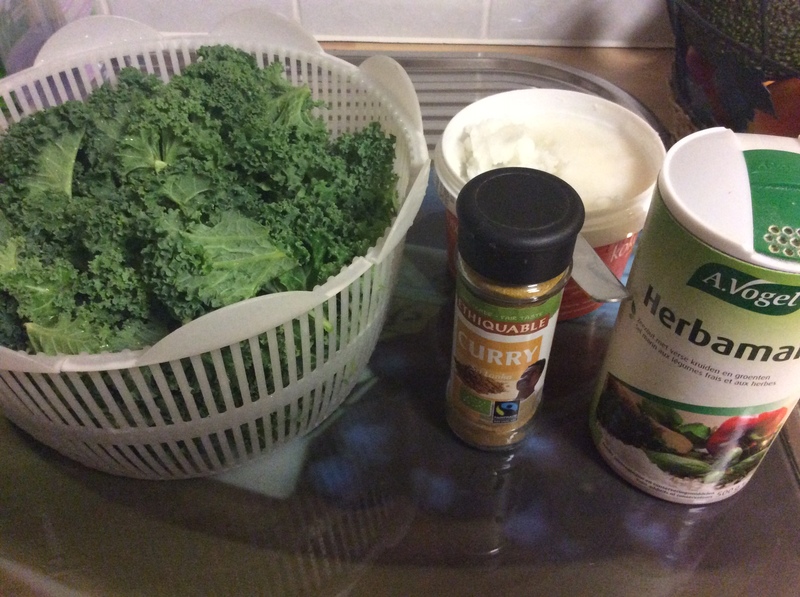 This entry was posted in Blog posts, Cooking, Food, vegan, Vegetarian and tagged coconut oil, curry, kale, nutrition, recipe, snacks, spices, vegan. Bookmark the permalink.